Transparency: A Path to Public Trust has been designed to provide approaches that you may consider as your company addresses transparency-related challenges and opportunities. It consists of a five-step process designed to assist in the identification of transparency-related opportunities and risks, determining the business case for action, and engaging your organization in developing and implementing an effective transparency strategy. Corporate transparency has emerged as a focal point of societal expectations. Increasingly, corporations are experiencing pressures from stakeholders to be more transparent about their values, commitments, and performance. In this “show me” world, stakeholders want to know who the company is, what it stands for, where it is going, and whether it is living up to its commitments to society. Companies have learned — at times the hard way — that increasingly their license to operate depends on having the public’s trust. By understanding stakeholders’ expectations for transparency and knowing how to respond effectively to them, companies may be better positioned to reduce risks, enhance their reputation, and increase shareholder value. 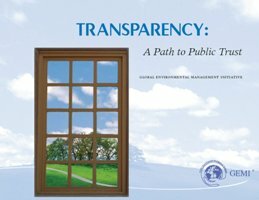 Transparency: A Path to Public Trust is the result of a collaborative journey by members of GEMI and others. It began with a series of three GEMI-sponsored workshops held between October 2001 and February 2003. During these workshops participants from nineteen separate nongovernmental organizations (NGOs) and sixteen companies worked together to explore the concept of corporate transparency. The dialogue and debate led to the recognition that there was both a need and an opportunity to help organizations approach transparency using a strategic, systematic process. This tool has been created in recognition of that need. Properly implemented, transparency may drive improvements in corporate governance, stakeholder relations, and performance reporting, all of which can deliver business value by enhancing the credibility and trustworthiness of an organization. Defining a strategic approach and establishing clear goals for transparency can help ensure that this value is delivered at the same time as associated risks are managed. Transparency: A Path to Public Trust is a tool that can be used to help develop an appropriate approach to transparency for your organization. It consists of a six-step process designed to assist you with identifying transparency-related opportunities and risks, determining the business case for action, and engaging your organization in developing and implementing an effective transparency strategy. Further guidance is provided to help you understand how to employ the key elements of corporate transparency – corporate governance, stakeholder relations, and performance reporting. Case studies demonstrate how several GEMI companies have addressed transparency in their organizations and share the lessons they have learned. Sections on challenges, trends, tools, and references provide additional information and context. Defining Transparency: GEMI has developed the following definition of corporate transparency: Transparency is the openness of an organization with regard to sharing information about how it operates. Transparency is enhanced by using a process of two-way, responsive dialogue. • Improve corporate performance by motivating an organization to meet its declared goals. Transparency by Design: An organization’s approach to transparency should be designed to fit its unique circumstances. Engaging in a strategic planning process is an effective way to decide on the most appropriate approach. The transparency process -- The fundamental management system process of Plan-Do-Check-Advance serves as an effective framework for developing a strategic approach to transparency. These steps outline a useful structure for identifying related business opportunities and risks, determining the business case for action, developing an appropriate strategy, taking action, and measuring and evaluating the results. The key elements of transparency -- Leadership and governance, stakeholder relations, and performance reporting have been identified as the three key elements of transparency and are given special consideration throughout this document. • Leadership and governance – It is through leadership and governance that the corporate commitment to transparency is defined and communicated throughout the organization. Leadership establishes expectations and accountability whereas good governance ensures that the commitment is implemented. • Stakeholder relations – Whereas stakeholder demands are a driver for increased transparency, stakeholder relations are a means to becoming transparent. Transparency provides stakeholders with the information they need, which in turn should improve the relationship. • Performance reporting – Elevated stakeholder expectations for transparency are driving companies to adopt beyond-compliance reporting of non-financial performance. Reporting provides a window into the organization and a means to disclose corporate commitments and performance. It can also be a cost-effective method for regularly delivering information to stakeholders in a consistent manner. • Understanding how to provide meaningful information rather than simply more data. Transparency: A Path to Public Trust is a tool to help navigate these challenges and trends. This tool uses a five-step strategic planning process based on the Plan-Do-Check-Advance framework to guide the development and implementation of an effective transparency strategy.